Could Sulzberger Stupidity Cause NYT Collapse? Although the New York Times circulation has been plummeting like a lot of other newspapers due to readers switching to the Internet for their news as well as being turned off by the extreme liberal bias at that newspaper, the ultimate failure of that periodical might be due to another reason according to an article in New York magazine. Sulzberger stupidity. And based on what New York has to say, we aren't talking about the ordinary garden style variety stupidity here. Sulberger stupidity comes on a massive scale of unerringly poor judgement in almost every major business decision. 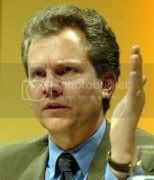 The prime culprit of Sulzberger stupidity is the Times heir, Arthur Ochs ("Pinch") Sulzberger Jr. although it seems that lack of judgement is also a trademark with the other branches of the extended family, which includes the Goldens and the Cohens, to the extent that there is a good chance that the 27 members of the fifth generation of the Ochs-Sulzberger family (founded by Adoph Simon Ochs) could well be the last generation of that clan to profit from the Times. Sulzberger hasn’t acted entirely alone. His cousin Michael Golden, vice-chairman of the company and until recently publisher of the beleaguered International Herald Tribune (the acquisition of which cost the company $65 million),Times headquarters on 43rd Street—which the buyer turned around and sold three years later for a $350 million profit (enough to fund the newsroom for more than a year, notes one Times oversaw the sale of the old New York veteran). A new headquarters on Eighth Avenue, designed by architect Renzo Piano and costing the Times about $500 million (roughly 25 percent of the company’s total market capitalization), was also his responsibility and is seen as a sign of the family’s dedication but also its vanity. “Man, he loves that building,” says a former Times executive who knows Golden. And that dark economic cloud looming on the Times horizon has moved ever closer. Once those dividends decrease drastically, as they inevitably will, the party will be over for the Sulzberger family. Conservatives would like to think that liberal Times bias will be the reason for that newspaper's eventual downfall but don't discount the factor of Sulzberger stupidity as an important cause of its failure.